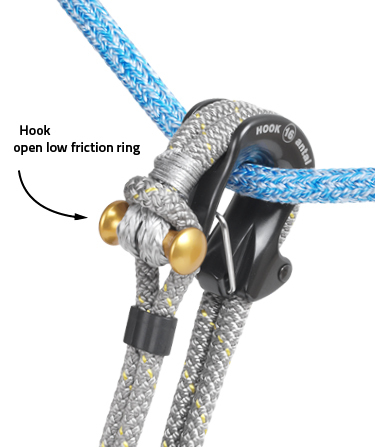 Hook can be easily hooked to a genoa or a spinnaker sheet: the lightest and strongest solution for a line control. Aluminium made, highly polished and hard black anodized with a spliced Dyneema Snap Loop. A safety spring prevents the line from dropping out. Spare Dyneena Loops are available. Low friction rings are the heart of Soft links. Simple, lightweight and resistant Rings, together with more sophisticated products, such as Solid rings and Hooks, revolutionized the way we design fixed and running rigging on sailboats, and not only on sailboats. Thanks to the perfect polishing Soft links give extremely low friction. If you wish to know more about the effective loss in terms of friction, read the article Friction on Rings. Thanks to their simplicity they cut prices down and require absolutely no maintenance. The first of Soft links’ characteristics is versatility. I can use a Ring as barber, or lazy jack. On the backstay bridle instead of a sheave or for 8:1 control systems. For reefing or 3D genoa adjusting. And obviously, as a block. The charactiristic of Antal Soft Links (Low friction rings, Rings and loop, Solid Rings, Hooks, Dyneema loops and Dog bones) is that the Dyneema loop is carrying the entire load. Therefore, we have maximized the advantages of Dyneema: a low stretch and extremely resistant rope. Weight is thus reduced, together with size and maintenance. On the other hand no breaking load is in the way, except that of the line! Calculating SWL, safe working load, usually includes testing breaking loads of each part and dividing by 2. In the case of Sof Links, ie where a Dyneema line is involved, we use a safety factor of 3, in order to grant that even wearing of the Dyneema line does not compromise the efficiency of our products. In other words, if Hook 16 has an SWL of 2200, it means that the loop breaks around load 6600 kg.